An historic Koranic school and small mosque in Tripoli was set on fire and badly damaged this morning. The attack on the Sheikha Radiya zawia in Sidi Khalifa near the central hospital occurred before dawn. The assailants are unknown, but they are assumed to be militant Salafists. Salafists and the various hard-line groups that have stemmed from the movement consider Sufis to be heretics: the Radwa mosque in Sinai in which was attacked on Friday by suspected Islamic State supporters leaving 305 people dead, was a Sufi mosque. Today’s Tripoli attack also coincided with preparations at the mosque to celebrate Mawlid Al-Nabi (the Prophet’s Birthday) which starts tomorrow, Wednesday, and which Salafists reject. Last year, there was a similar attack the day before Mawlid. 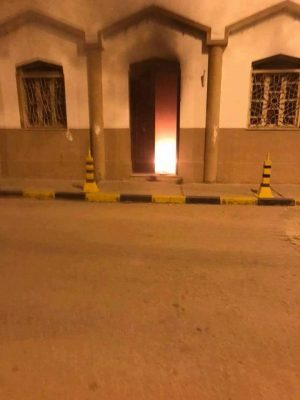 Salafists forced their way into a mosque in Zliten’s Sebaa district, put an end to the recitals of religious poetry to celebrate the occasion and started smashing the building with hammers and crowbars. They declared the event to be haram. It may be, however, that the Sinai attack was used as inspiration for today’s outrage. The zawia/mosque is one of Tripoli’s oldest Sufi centres. It was founded and endowed by Sheikha Radiya as a place to teach the Koran and is seen to this day as a striking example of a woman’s role in supporting and disseminating Islam. It has been served by many distinguished Sufi clerics and imams, the best known among them being Sheikh Mohammed Ibraheem Gadah, Imam Sheikh Mahmoud Gashouta and Sheikh Al-Hashimi Gashouta. There has been a tradition, on the first Friday after Mawlid as part of the celebrations in Tripoli, that Sufis walk from Sheikha Radiya mosque, chanting Sufi hymns, through to the Old City. Tripoli and elsewhere has seen far fewer attacks on Sufi zawiyas, shrines, and mosques by Salafists than in 2012, but that is because so many have already been destroyed.